It didn't take long for Star Wars: The Force Awakens to make history and break records at the box office, destroying Jurassic World's $208.8 million opening weekend with a whopping $247.9 million. The blockbuster made history in another way, though, since it was the first movie that we haven't seen some incarnation of Darth Vader/Anakin Skywalker. Of course, some can make the case that Vader was represented by the burnt mask Kylo Ren (Adam Driver) seems to idolize, but, as it turns out, the Sith lord almost did appear in the flesh, so to speak, according to a report from Making Star Wars. A new Star Wars: The Force Awakens book debuted yesterday, entitled Rey's Story, which includes a passage that offers new details on Rey's (Daisy Ridley) "Force flashback" after she touched Luke Skywalker's (Mark Hamill) lightsaber at Maz Kanata's (Lupita Nyong'o) bar. 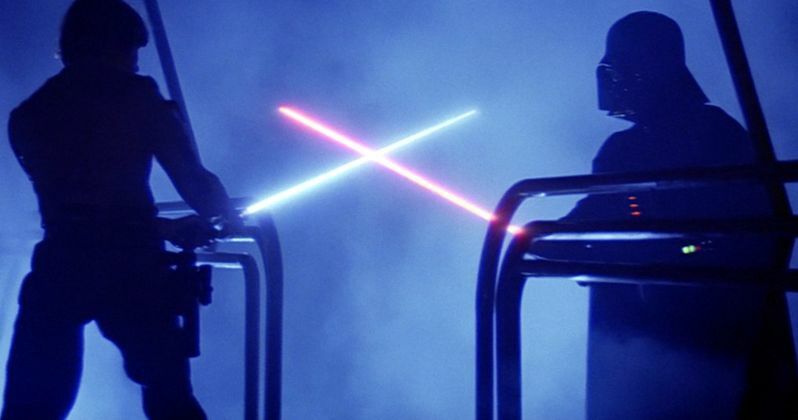 This scene is actually the iconic duel between Darth Vader and Luke Skywalker in Bespin at the end of Star Wars: Episode V - The Empire Strikes Back. According to this report, the scene was actually cast and possibly shot to be included in this flashback scene, but it never made it into the final cut. Here's a description of the scene from Rey's Story. "As she peered into the distance, she saw a man in black wielding a red Lightsaber. His face was covered with a mask, molded to approximate a human face. But the mask's eyes were dead and empty. The man's red Lightsaber clashed against a brilliant beam of blue. A young man with blond hair raised his own Lightsaber and fought furiously against the monster in black." While this doesn't mention Darth Vader or Luke Skywalker by name, it's worth noting that the flashback sequence in the movie actually opens with Rey on Bespin, and it's believed that, if this scene would have been shot, she would have seen this iconic duel from a whole new vantage point. The sequence is said to be purposefully vague, since Rey has no idea who she's actually watching, but if viewers would have seen this unfold, they would have known exactly what was happening. The site also reports that there were actors cast as the young Luke Skywalker and Darth Vader, but their identities were never uncovered. At one point during production, it was rumored that WWE Superstar Sheamus was cast to play Darth Vader in a flashback. And there was also a report that Robert Boulter had been cast in the movie to play a young Luke Skywalker. There is another excerpt from this book that calls the man Kylo Ren killed in the flashback a "hero." "Before she knew it, more images flashed through her mind: a hero stabbed by a fiery blade, a battlefield filled with soldiers, a blue and- white droid beside a lost Jedi." While we don't know for certain, it's possible that this scene could end up on the Blu-ray and DVD's deleted scenes, but we don't have confirmation quite yet. Last month, an Amazon listing revealed that the Blu-ray and DVD would arrive on April 5, but that date has still not been confirmed by Disney and LucasFilm, and the Amazon listing has since removed that street date. Do you think this iconic scene could end up on the Star Wars: The Force Awakens Blu-ray and DVD?